This is a Walt Kellyism, initially cherished by Kage because it sounded absurd. And because no one in Pogo ever knew exactly what it was. 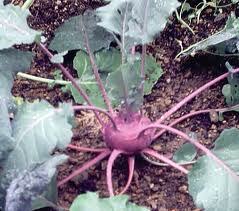 And because when I finally found out about kohlrabi and showed her a picture of it, she had laughing hysterics. Kohlrabi is a vegetable of the cabbage family – related to cabbage, broccoli, cauliflower, collybrolly, broccoflower and all the other unnatural hybrids of Brassica that slouch through the world. Kage would eat very few of them, but she honoured them all in the abstract because of their maritime history. Before the British got into citrus fruit and became known as Limeys, they were heavily into pickled cabbage as an antiscorbutic. Anyway, kohlrabi is a weird vegetable that comes in the usual pale green and livid purple shades of most Brassica kin. It is also known as the German turnip, for reasons I never learned. It’s main claim to fame is the way it looks in the field – it has many spindly little stalks or leaves or roots or God knows what, on which it grows above the field. It looks exactly as though it is levering itself out of the ground on multiple limbs, like a Martian invader. Seen in the grocery store, they have always been neatly trimmed and emasculated, thus occasioning no fear among naive shoppers. However, when seen in the field – and they do grow widely in California, like every other freaky vegetable – they look like an alien army pulling itself out of the ground to come get you. What do they taste like? I have no idea. But they’re Brassica, after all, so they probably taste like cabbage: which is like wet stone, with overtones of old newspaper and despair. Anyway. Kohlrabi was a source of much snickering for Kage. And the cold robbies, that amorphous disease of Walt Kelly ( who clearly had no good idea what the hell it was either) was her favourite description of general malaise. I wish I could recall what the cure for Cold Robbies was. According to Wikipedia, you need Aunt Granny’s Bitter Brittle Root. Looks a bit like a triffid! I was about to field the theory that kohlrabi (is there a plural?) might just be an immature triffid and they all get trimmed and, presumably, eaten before they can grow up to be big, bad, and mobile? As to the cure for the Cold Robbies, isn’t it chicken soup and/or strong drink? Perhaps a nice slug of Capt.Morgan rum would do the trick. In the rare instances where it really *is* Cold Robbies, the actual cure is as neassa said – Aunt Grannie’s Brittle Bitter Root. Whcih what it is, I have no clear idea either and haver have … in all other cases, any strong drink will do. Because it may not cure you, but you won’t care anymore! Widdershins – they do. Even more so when you see them live, up close and in person. Horid things, really. It’s obvious–the cure for a cold robbie is a hot toddy! Well, I grew up eating them, and I can tell you they’re actually not all that bad. Weird, yes, but not all that bad. My mother peels the tough skin off them, then slices them across the grain (imagine slicing an onion the way an expensive burger joint would). We dip the slices in a bit of lemon juice, put a tiny dash of salt on top, and voila! They taste something like a cross between jicama and a cabbage core. Again: weird, yes. But not too bad, especially on a hot day. Although that may be due to the lemon juice. As for the historical/racial reference, I *think* that may relate to the winter of 1916–there was a terrible frost in Germany that year, right during the Great War (when all the ‘good’ food was being sent to the front for the war effort already), and the kohlrabi was one of the few things unaffected by it. So the Germans ate a LOT of them. Just guessin’, though. Also, I have been Gone for a week and a half, and am now trying to get caught up–I hope that your cold robbies have vanished by now (I assume that they have, but I shouldn’t do that). David – thank you for the hitherto-unknown fact. I love getting those! You have added another facet to the ancient lore of Kohlrabi for me. However – you ate them RAW?!?! They look too much like space aliens for me to try that. But you’re brave.